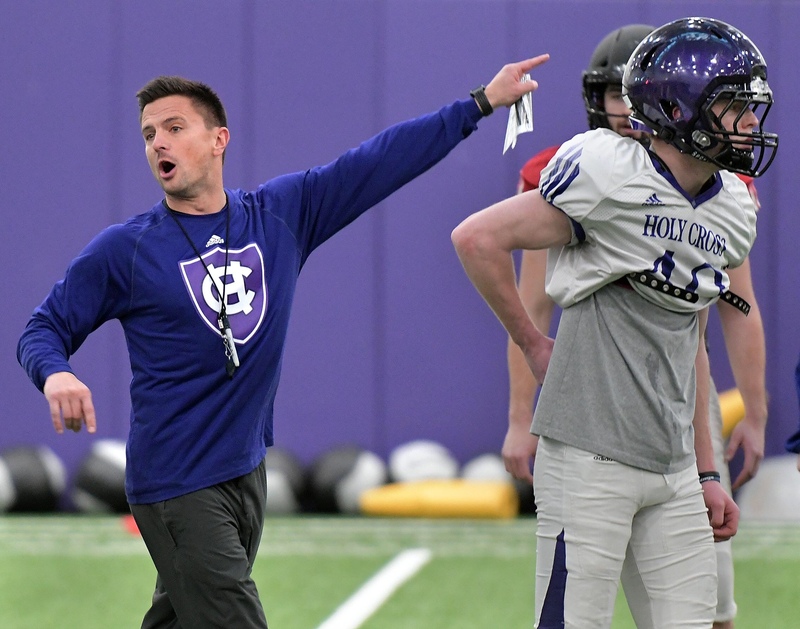 Second year Head Coach Bob Chesney is turning the Holy Cross football program around by creating a winning culture and a big time college football atmosphere. Chesney, who came to Holy Cross from nearby Assumption College has turned the once dormant program into a relevant program that is once again on the rise. The Holy Cross administration has invested in the program in recent years with upgrades to the facilities, including an indoor facility. Despite the investment, it hasn’t translated on the field. In order for that to happen, the culture had to change first. Chesney orchestrated turnarounds at Salve Regina and Assumption so he knew that the first step in turning a program around is to build a winning culture. Chesney and his staff started the process by ramping up their recruiting efforts and adding more talent. Chesney is a terrific recruiter with an infectious personality. He is positive and full of energy. Those traits appeal to recruits. A stronger schedule also helped improve the program’s national profile. Holy Cross played Boston College, UNH, Yale and Harvard last season. Next season, they open at Navy and play at Syracuse. The stronger schedule puts the program back on the map nationally and makes it more appealing to recruits. Chesney and his staff have done a great job of promoting the program as well on social media. The program has created a footprint locally on twitter and is gaining more of a following. The Holy Cross football program has a rich history of success. While the program has struggled of late, the potential is there for it to once again become relevant. Bob Chesney is the right coach to get the program back on track. He has already changed the culture as evident by the team’s 5-6 record last season. Now it is time to take the next step and compete for championships. The Crusaders are well on their way to doing that.